It wasn’t without a good amount of trepidation that I decided to invest a fair sum of money in buying a WHOLE BUNCH of plants for the new apartment. The daylight here is perfect, though, and the deep windowsills really lend themselves to plant life. So, with a fresh attitude and about $150, I went for it! I bought a few plants at IKEA and Home Depot, but most of them came from Adams Fairacre Farms in Newburgh. If you live in the Hudson Valley and somehow don’t know about Adams (they also have locations in Kingston, Poughkeepsie and Wappingers), you’re missing out big time. Aside from having an awesome produce department and a full-service grocery store, Adams has a plant/nursery department that never lets me down. They have a great selection, reasonable prices at all times, and excellent seasonal sales. (They also have a great refund policy for any perennials that kick the bucket, so save your receipts.) Anyway, enough about Adams—I’ve been going there since I was a kid, and it’s fab. Plants pictured above, left to right: Zebra plant, tiny cactus (that’s the scientific name, haha), assorted succulents, trailing jade (it broke off in transit and I’m letting it grow roots), crown of thorns. I’ve had this fiddle leaf fig tree for a while now. It was really small (also: cheap) when I bought it…maybe a year and a half ago? It would probably be bigger than it is now if I hadn’t been so stupidly lazy about getting it into a proper pot. I had it in its plastic starter pot until a month ago! The woven bamboo pot it’s in now is a larger, black version of the PARANÖT pot from IKEA—it’s not on their site, but I’m pretty sure they still carry it. And hey! 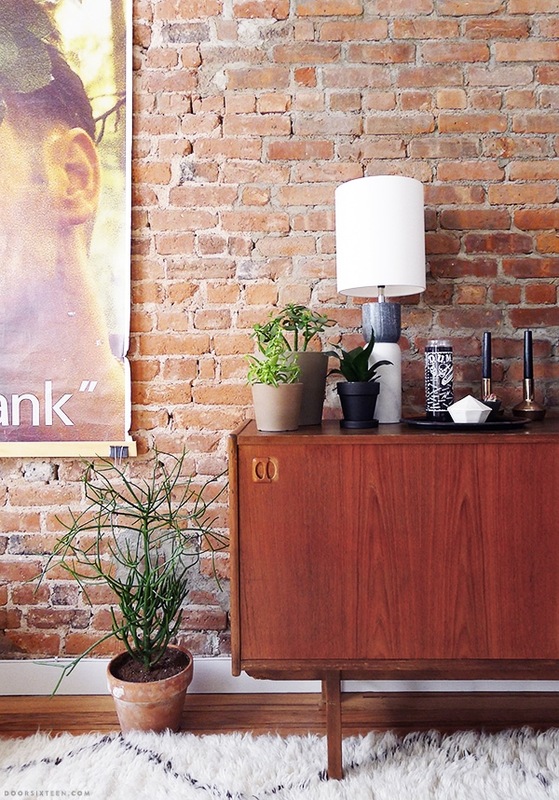 There’s my Morrissey poster that’s been going everywhere with me for the past 24 years. The leafy branch over his head is right at home in the new apartment! Left to right: Dracaena, string of pearls, hoya rope plant, hoya heart plant (hanging), spoon jade. The hanging basket is the DRUVFLÄDER from IKEA, and the sweet little ceramic hanging planter is from Small Spells. 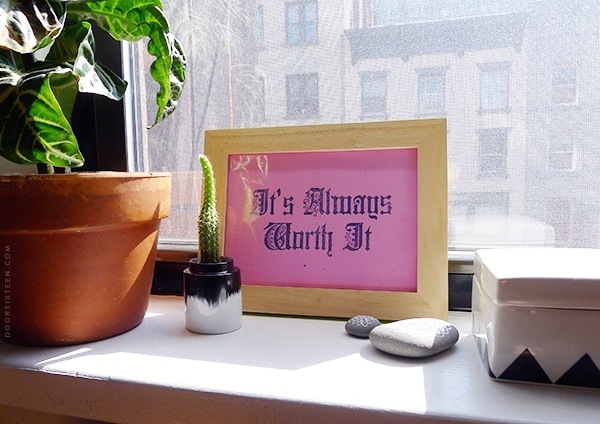 I am still grieving Brooklyn’s loss of the Kentile sign last summer, but this laser cut chipboard model from Boundless Brooklyn is a nice daily reminder of its place in my heart. Before I talk about the plants, can I tell you about my new lamp? It’s the stacked marble table lamp from CB2, and I love it. 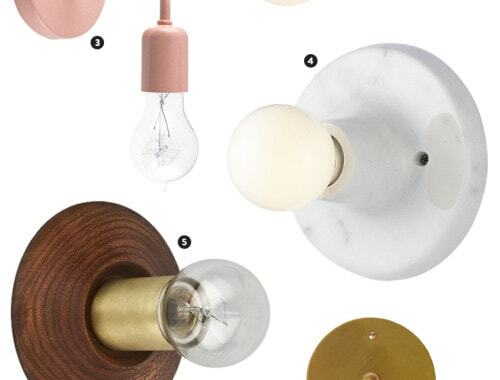 CB2 has been killing it all over the place lately, especially with lighting (please buy this sweet pink glass and marble lamp and think of me, because I want it but have nowhere to put it). For some reason I wasn’t expecting the lamp to be this big and HEAVY (who knew solid marble would be heavy…), but I’m not complaining. OK, plants! Left to right: Pencil cactus, something I can’t identify, jade plant that’s recuperating after being moved from the old apartment, black robusta snake plant. I’m obsessed with the pencil cactus. It looks like a crazy monster and I really hope it doesn’t die. I think my favorite of the new plants in my life is this trailing jade vine! It’s doubled in size in the past month, so I’m pretty sure it likes living with me. I bought the macramé planter holder and the faceted pot (now totally obscured by the plant, but oh well) from CB2 at the same time as the lamp, and both are pretty perfect. I’ve never had any macramé in my life before, but it feels good. The banner is from Secret Holiday & Co. It’s OK! Such a happy little spot! The teeny cactus pot is from Normann Copenhagen, the print is by Lisa Congdon, the rocks were painted by Diana Fayt (sweet tokens from Lisa and Clay’s wedding), and the ceramic box is from J.Crew Home. Ha! I bought that ceramic box and the similarly-patterned little dish on clearance at J. Crew and almost tweeted at you about them but then decided it would be weird. such a gorgeous space. everything looks so lovely! i’m moving to a new house soon (with more light!) and can’t wait to add more plants to my collection. i’m really good at killing the plants everyone swears are easy to take care of, like succulents and air plants. i don’t know what my deal is. 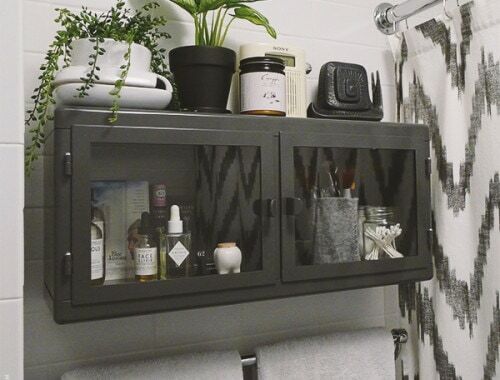 that macrame hanger is totally amazing, and the price is on point. does the faceted pot have a drainage hole at the bottom? 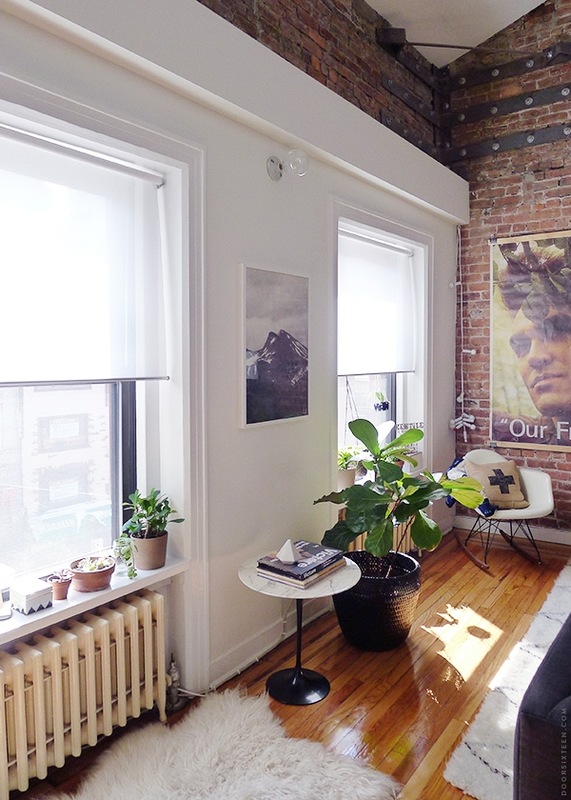 I’m really enjoying following these posts, the apartment looks fantastic and the plants are a great addition. At the moment, because we travel a lot I have resigned myself to only plastic ikea plants and hardy cacti indoors. Do keep us updated as to how you get on with your new collection, especially the pencil cactus! 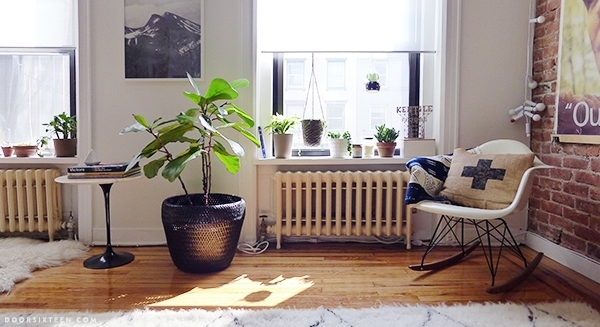 Your apartment looks so beautiful with all those plants bringing it to life. I love that pencil cactus too. I have my eye on one but I have no room for it right now in my apartment. Thank you, thank you, THANK YOU, Anna! You just made my month…I had no idea there was a Kentile Floors replica in miniature. The original is one of the things I miss most about BK (after all. I saw it twice a day for 20 plus years). I was so sad to be on the F last time I was home and not see it! I’m gonna order that model right now. It’ll pair so well with my new Pop Chart Lab water towers print. The model is really nice, Judi, as are the folks who make it. Enjoy! The light in your new apartment is amazing! And I love that you did a whole post just about plants. I think they’re an oft-overlooked dimension of creating “home”, so I’m glad to see them getting some love on one of my favorite blogs. I hope they all love living with you and flourish mightily! Thanks so much for the incredible support — and the honor of having one of our kits in your new Brooklyn home! Thanks!! It is indeed in water (it has been for about 7 weeks), and it is indeed growing roots, so…I dunno! I admit I did not do any research prior to sticking it in water, I just did it, haha. I change the water every couple of days, and it seems to be coming along nicely. Maybe trailing jade is different? How nice it all looks! I’m sure the plants will thrive with all that light. Do you have sun as well as bright light? I’m happy for you that you have such generous window sills (do I sound a little jealous?). 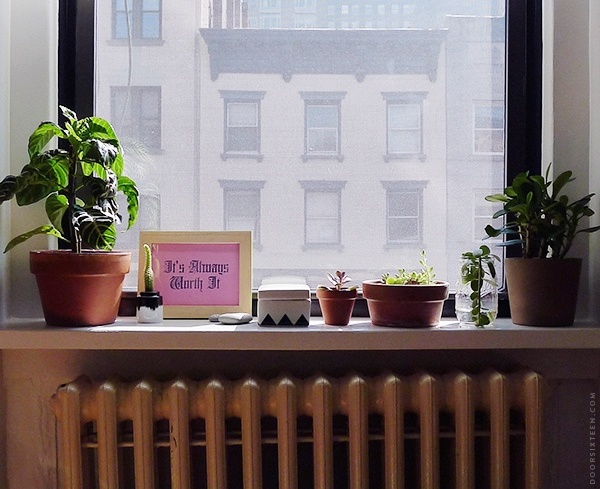 Love the way you display your plants and your apartment! please make more tours. I am new to decorating. And please include the all the sources of your products displayed in the pics. I loved you gave the names of the plants and where you got some things. But I also need to know where did you get the copper candle holders. Hi Carla, the candle holders came from H&M. Anna, this looks lovely. I have faith that you’ll be able to keep things alive! I failed for many years straight until I moved into my most recent apartment, and now I have 40-some plants that are all thriving. Katrina, thanks for the heads up on the pencil cactus. I had NO idea. I’ll move it to a safer location right away! Lovely. All that natural light is amazing. Pretty plants! By the way, your post reminded me to water my one lone little house plant. Thank you! Haha. Your whole plant set up is just lovely! 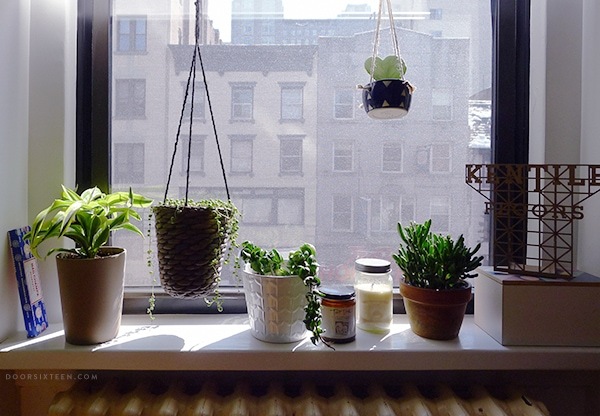 I’m envious because I want to have more little plants in the apartment – and we have the perfect window area for it, too! – but we have two new puppies who like to take bites out of my one plant. Gah. 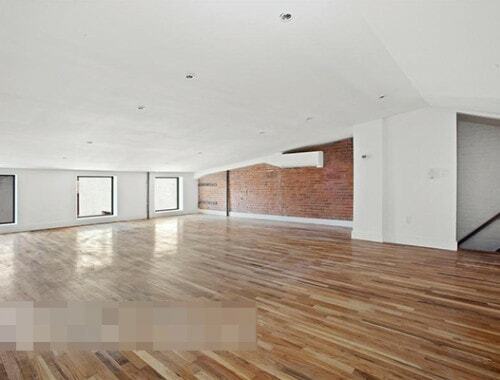 Anyway, the new apartment looks great! Ooh, so much greenery! We picked up a pencil cactus a little before the holidays, and it’s going nuts! It gets crazier and crazier, which is obviously awesome. A plant that I’ve learned we cannot kill even if we tried is a zz plant. We have about 4 throughout our home now, and one of them lives in the guest room. I forgot about it for about, oh, 2 months? I went in to check on it, and it had actually GROWN. Oh, fiddle leaf figs are so touchy! I’ve had mine since August, and every month it seems to give me a scare and I’m sure its going to die (all the leaves droop and one or two will even fall off) but then it perks up again and looks happy. Maybe its the cycle of the moon or something. Who knows! This post is so timely for me. I am having a love affair (silently and by myself) with house plants. BUT, we too kill them all. I’ve just gotten a jade to hang and a snake plant (very cool looking). And I’m going to see how I fare/it fares and go from there. Dreaming of a dracanacea like yours and more. Good luck! It all looks wonderful so far! Love the plants, and your apartment is beautiful! I’ve been obsessed with a couple of large Yucca plants I bought recently- here’s the wall in our (newly renovated!) reading nook: http://sarahmkeller.blogspot.com/2014/11/the-reading-nook-chalk-wall.html. What’s sad (and happy) is we’re about to move to Germany, which means some lucky friend will be enjoying them for us… But I think my favorite part about them of all is THEY’RE STILL ALIVE, you’re not alone in your struggle to sustain plants, LOL. I LOVE this post! I’m currently trying to dip my toe back into the house plant pool even though I reliably kill them. So far I’ve lost three succulents that were supposed to be fool proof. Root rot, I think, even though the only water I gave them was when I potted them 🙁 I have horrible light in my apartment, which isn’t helping my cause. Regarding your string of pearls in the Ikea basket, is it planted directly in the basket, or is there some kind of liner? There has to be, right, otherwise you’d soak the basket during watering and it would start to deteriorate? Jen, I don’t know who came up with that bit you always hear about succulents being “easy,” because I actually find them really difficult to keep alive…even if, as you say, you’re really careful about not over-watering them. Orchids (oddly enough) do amazingly well here as well (despite a structural amount of care). I’m loving your urban jungle 😉 . And your apartment has wonderful light. The Mister takes care of our plants, ’cause I don’t think I’ve managed to keep one alive. At least not for too long. A while ago my parents went away for a looong holiday (four months) and I had to take care of their plants. As a welcome back present my brother and I bought them a new couch, but the first thing my mom said when she set foot in their home was: “Ohhh, my plants!”. It took some time for her to realize there was also a new couch. First she had to recover from the death of almost all her plants. 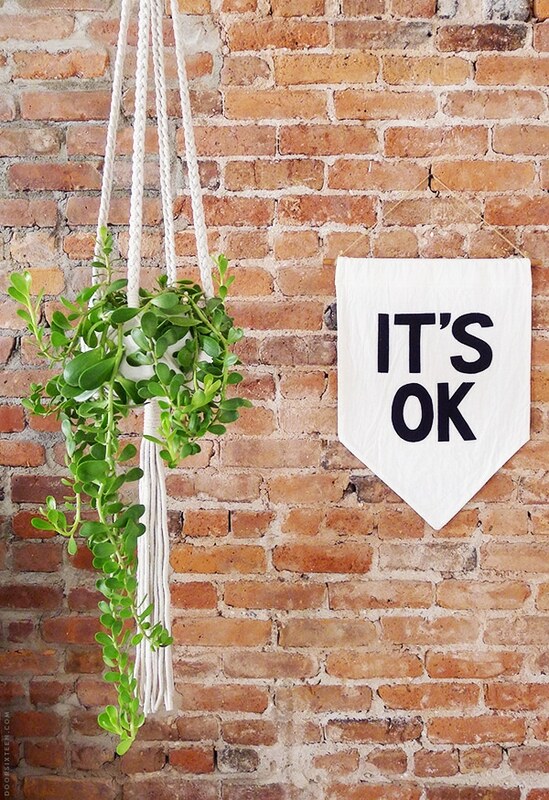 Such a beginner question – how are your hanging plants hanging in the window? Tension rod? Magic? I’d love to add a few plants to our DR this way but am not sure to the technical how-to. The plants look stunning! It’s inspiring me to add a few to liven our home. Now I know what to do with that little tiny pot from skandicrush…. stick a cactus in it. Thanks! I got a pencil cactus too, despite the dire warnings and so far nothing awful has happened AND I can’t seem to kill it. It was a cutting off of a neighbors plant and it survived all winter in my laundry room with little to no (zero) attention. 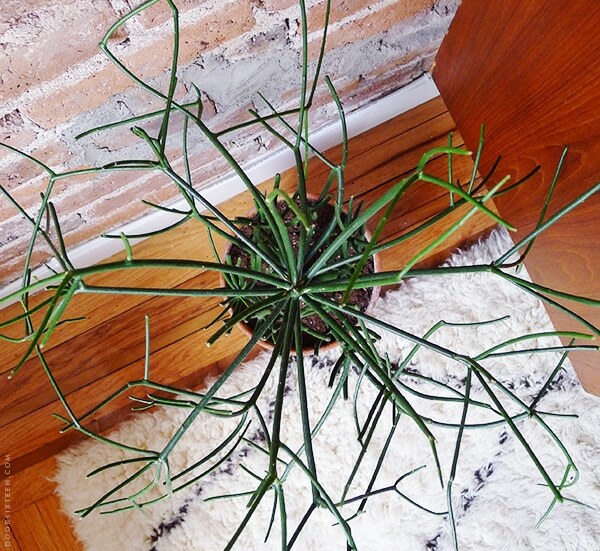 it’s got new growth on it and is back on the patio… so yeah… you can’t kill it. Hi Anna! Longtime reader and admirer of your aesthetic…I’d love to know where the mountain print is from! Lovely space as always. 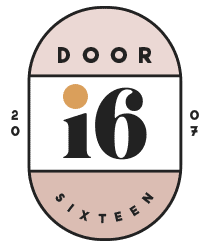 Hi, Love your website and your place looks great – where did you get your rug from please?